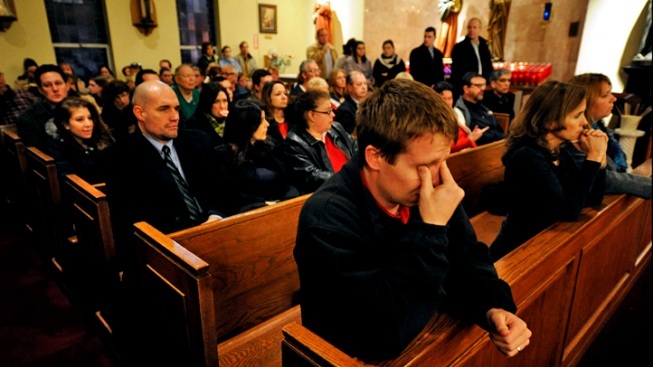 Parishioners inside St. Rose of Lima Catholic Church in Newtown, Conn.
Parishioners at a church that lost eight children and two adults in the shootings in Newtown are being told to embrace the Christmas holiday. The message came at St. Rose of Lima Roman Catholic Church, where a standing room crowd attended Mass on Sunday morning. The priest told those gathered to be like the character Natalie Wood played in the film "Miracle on 34th Street," who said, "It's silly, but I believe." He said in the wake of the tragedy it is important to believe in Christmas and that God, like Santa Claus in the movie, will ultimately provide what he has promised -- a life without death. Six police cars from Hartford and Monroe were outside the church, which was the target of a bomb threat last Sunday.